We’re excited to announce the launch of a brand-new Athletics website and mobile app! Thank you to our partners PrestoSports and Mighty in the Midwest for a great collaboration. Download the app for iOS App Store and Google Play. One of the great things about working for Public Affairs and Marketing is that no day is quite like the next. While I do spent a good amount of time at my desk, my bosses have also instructed me to do things like go to the beach, assist web training classes, and participate in campus wide films. It’s these kind of spur of the moment tasks that make me love this job even more. 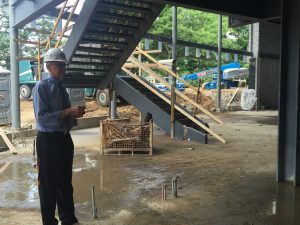 So today when I was asked to take some pictures of the Multicultural office, Student Life, and Dean Frost signing a beam in the new Bultman Student Center, I jumped at the opportunity. I met the group at the construction trailer and was immediately given a hardhat and safety goggles. I started to wonder if maybe I shouldn’t have been so quick to jump at the opportunity, seeing as I was the only one not wearing closed toed shoes, but once I entered the student center any thoughts about my footwear were quickly tossed aside. The space was absolutely incredible. 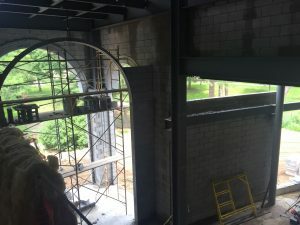 Boasting tall arches, a 200 seat theatre, and tons of space to be used for just hanging with friends, it was truly heartbreaking to walk through and know that I’d never get to use this space as a student myself. But even though I personally won’t be able to use the space, getting a sneak peak tour today made me so excited for all the future students who will be able to use it. The space has so much potential for so many different uses. 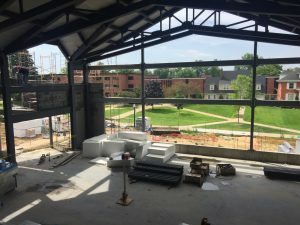 For instance, it has tons of space that will hold high tops and couches that I think will be so fun for students to use as a more low key and social study environment, rather than, say, the library or Martha Miller. As someone who frequently gets dirty looks on the first floor of the library for laughing or talking far too loudly, I know I would definitely put this space to use. 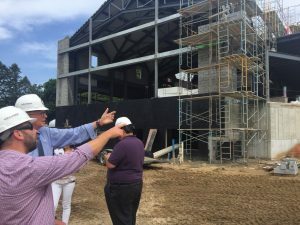 We were also shown the space that will be used as a prayer chapel, something I didn’t even know was going to be included in the student center, so it was really cool to both see the space and also hear the plans they had for it once the building was finished. Even from just looking at the bare bones of the room, I can tell it’s going to be a beautiful space for students to de-stress and relax. Throughout the whole tour, I just kept thinking to myself how lucky I am that I go to a smaller school like Hope, that offers intimate class settings and personal relationships with both students and professors, but is also able to build beautiful buildings, like the Bultman Center, that spare no expense to give us students a space that really makes Hope feel like home. 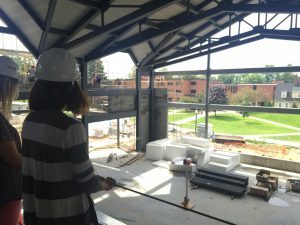 I hope you guys enjoy the sneak preview pictures and are able to envision all the opportunities the Student Center will offer next Fall.